The convergence of technology that accelerates the power of relationships and facilitates dynamic communications--peer to peer and to entire communities--is revolutionary to say the least. The book defines The Relationship Economy as “The people and things we are connected with in our personal networks, who or that distribute or consume our capital, which in turn influences our individual production outputs.” The book analyzes the factors that are influencing an emerging economy based on the sum of factors driving massive and significant changes to the way everyone will work, play, and live. This emergence will have an especially profound effect on businesses and individuals. While individual factors are self-evident, the collective factors, taken as a whole, are the basis for individual conclusions for strategic opportunities that can be gained from the new economy. The book provides the knowledge, tools, and suggested skills necessary for improved comprehension of the strategic issues required to succeed in The Relationship Economy, and provides the context of actions that enable success. It covers an emerging opportunity for the global community of users/consumers/prosumers/citizens, consumer brands, corporations, non-governmental organizations, and governments to play a critical role in forging this new carbon-neutral economy: The Relationship Economy. This book details an emerging economy, driven by factors that are affecting massive changes to the way people work, play, and live. This emergence will have an especially profound effect on business. While individual factors are self-evident, when taken collectively, they are the basis that individuals use to identify strategic opportunities to be gained from the new economy. 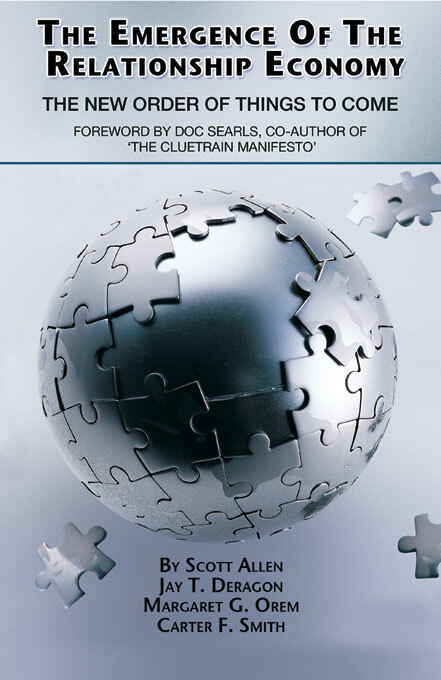 This book is a foundational resource for individuals and entities to use as each begins to plan for participation in the accelerated changes brought on by technological advances of the World Wide Web. The goal of the book is to enable each person to gain perspective, knowledge, and insight as to the dynamics of technology, the impact of changes brought on by the social Web, and what factors should be considered for the purposes of planning for success. The Web is steadily becoming a utility of the masses. We have become familiar with using the Web for communicating, surfing, shopping, receiving information in different forms, and a host of other usage attributes--both personal and professional. Jay T. Deragon is considered one of the premier entrepreneurial thought leaders in the dynamic social networking space and the emerging industry of social networks. His blog - relationship-economy.com serves as a reference point for the emerging industry of social networks. He has had a successful career as a serial entrepreneur--founding, operating, and selling several businesses operating in a wide spectrum of industries. Link to Wall Street - linktowallstreet.com. In addition, he founded Wireless Factors, wirelessfactors.com, that serves the networking needs of the global Wireless Communications Community. Mr. Deragon has spoken at industry conferences around the world, and personally conducted over 100 international seminars on a variety of management topics. During the dot com boom, he started several web initiatives and sold them while working with some of the best technology firms in the world. • Link to Wall Street - linktowallstreet.com. Ms. Orem was the Founder and CEO of MGO, Inc., which conducted business as the Rhode Island School of Modeling, the Rhode Island Model Agency, and Model Choice Cosmetics. She previously served as CEO and President of Technical Career Institutes, Inc. located in New York City, and as Vice President of the New England Institute of Technology. Prior to that, the Trustee appointed her in Bankruptcy as President and Chief Operating Officer of Wilfred American Educational Corporation, which owned and operated both post-secondary educational institutions and a publishing company. Prior experience includes holding posts as Special Assistant to the Deputy Assistant Secretary for Student Financial Assistance and Chief, Campus-based Policy in the United States Department of Education. In the latter capacity, Ms. Orem directed the development and interpretation of federal student financial assistance legislation, regulations and policies for programs in excess of $10 Billion USD. She is currently a Board Member of the International Debate Education Association-US - idebate.org. Inducted into the Tau Alpha Pi Honor Society, Ms. Orem holds an MBA with a concentration in Global Management and a B.S. in Behavioral Science. Carter F. Smith is an educator, trainer, strategic networker, and facilitator, with a background in government, non-profit and for-profit organizations. Mr. Smith is Senior Partner of Link to Your World, LLC lintoyourworld.com. In addition, he is an Adjunct Professor at Austin Peay State University and Mountain State University, and a S.T.A.R. Instructor for the Federal Law Enforcement Training Center, part of the U. S. Department of Homeland Security. He has adopted the unique edutainment teaching style, using a variety of platforms, including social media, to enhance learning and facilitate comprehension. During his more than twenty-two year career with the United States Army, Mr. Smith served as Criminal Intelligence & Anti-Terrorism Program Manager, Team Chief of the Gang Suppression Team, Detachment Sergeant, and Special Agent-in-Charge for the US Army Criminal Investigations Command (CID). Mr. Smith is a member of the faculty advisory board for the Global Security Institute at Austin Peay State University; and a founding board member of the Tennessee Gang Investigators Association tn-gia.org and Square One Ranch squareoneranch.org. Mr. Smith is a Ph.D candidate at Northcentral University. He received a Juris Doctorate from Southern Illinois University - Carbondale, and holds a Bachelor’s degree from Austin Peay State University. The recipient of numerous Army Commendation and Meritorious Service Medals, he was also designated as the CID Command Enlisted Special Agent of the Year. Mr. Smith is a member of Phi Alpha Delta (Law Fraternity), and the CID Special Agent’s Association.